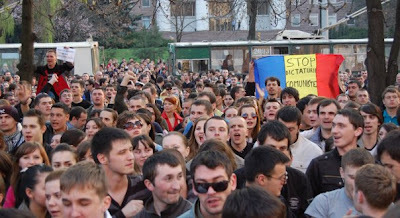 Barb In Moldova: Moldovan Youth - not apathetic! 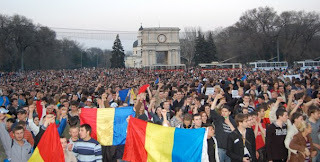 Moldovan Youth - not apathetic! "The election results were based on a final vote count from Sunday's ballot. Turnout was more than 59 percent. There are two days to consider challenges.Opposition parties raised the specter of a new election by saying they would not join a coalition with the Communists. If the Communists fall short of 61 seats and no president is elected in three ballots, another parliamentary election must be called.Three opposition parties passed the 6 percent barrier to enter parliament. All three are broadly in favor free market policies and closer ties with the European Union and do not object to membership in NATO. It's well-known that there is a LOT of cabbage in Moldova. 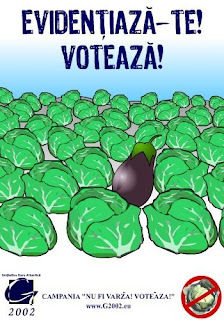 I laughed when I saw this poster from the voting campaign whose title means: "Don't be a cabbage! Vote!" Posted by Barb at 12:00 a.m.